FIFA president Sepp Blatter told reporters Tuesday that Israel has promised to help solve problems associated with soccer clubs travelling in and out of the Palestinian territories. FIFA president Sepp Blatter says Israel has promised to help solve one of Palestinian football's biggest problems: Travelling in and out of the Palestinian territories. After meeting Israeli Prime Minister Benjamin Netanyahu on Tuesday, Blatter said the Palestinian travel problem was "of national interest" to Israel and Netanyahu agreed to help solve it. "I have asked the prime minister to help me and to help football to try to solve this problem and he said, 'Yes, I will help you,"' Blatter said in a media conference. Because of Israeli security restrictions, members of the Palestinian national team are often unable to travel between the West Bank and Gaza for matches. Foreign players and officials have also encountered problems in entering the separate Palestinian territories. At the FIFA Congress in Mauritius in May, the group called on Blatter for help. Jibril Rajoub, the president of the Palestine Football Association, argued at the event for sanctions against Israel. This week, he called the travel restrictions a "siege on Palestinian sport." Very few people enjoy free movement between the West Bank and Gaza, which is controlled by Hamas Islamic militants who are committed to Israel's destruction. Israel restricts movement for security reasons. In one famous case, Israel imprisoned a member of the Palestinian team for nearly three years before he was released last year after a lengthy hunger strike. Israel accused Mahmoud Sarsak of being active in the violent group Islamic Jihad, a claim he denied. Blatter said he intends to create a taskforce to find a solution to the travel problem. He suggested Rajoub and Israeli Football Association chief Avi Luzon, along with the heads of football's European and Asian governing bodies, meet before the next FIFA executive committee meeting in October. He also cautioned that FIFA could not overcome political deadlock. "There are some constraints that we, FIFA, cannot open. We need the help of the authorities," Blatter said. Neither he nor Netanyahu provided any details on potential Israeli government plans to solve the problem. However, Luzon denied there was any problem. He said government data showed that all of the Palestinians' travel requests for 2013 had been approved. "If they have some claim, I don't know what it is about," Luzon said. The meeting between Blatter and Netanyahu also underlined the political value of football. Netanyahu defended the Israeli bombing of a football stadium in Gaza City during Israel's incursion into Gaza last year, displaying posters of images he said showed the stadium being used to launch rockets at Israel from a civilian neighbourhood. 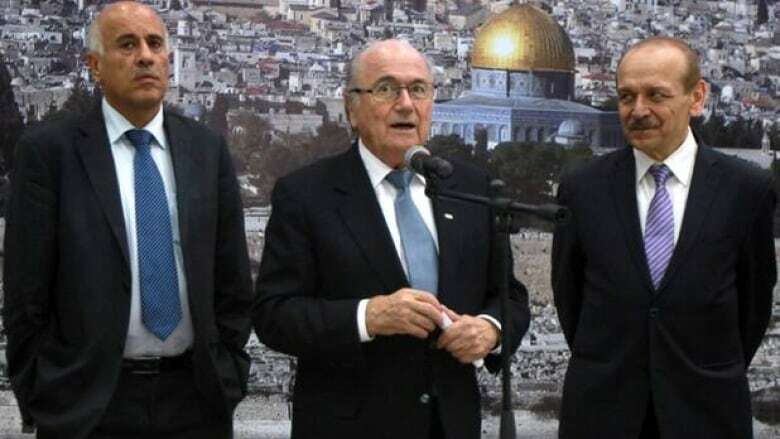 Blatter said that while Netanyahu had offered to help, he has requested "that football shall not be used as a leverage of any other activities than football, especially not political movements." The FIFA chief was also forced to address domestic controversy in Israeli football. On Monday, a government committee headed by Sports and Culture Minister Limor Livnat called for Luzon to step down because of conflicts of interest. The committee issued a report calling the IFA "rotten," a term at which Luzon angrily fired back at the news conference. "Whoever calls the IFA rotten has something rotten in his brain," he said. FIFA rules forbid governments to interfere with their countries' football governing bodies. The organization last week suspended Cameroon, a major power in African football, when its government allegedly helped install the new president of the Cameroon Football Association. Blatter warned that FIFA would have to take similar action against Israel if the government forced Luzon to step down.